The Texas Parks and Wildlife Department has confirmed the presence of invasive zebra mussels in Belton Lake, and experts worry the species could jeopardize the water supply in Central Texas towns. With the discovery of invasive zebra mussels in Central Texas' Belton Lake, experts are now worried that the destructive bivalve's spread will create long-term logistical and ecological complications for the state's reservoirs and drinking water. The Texas Parks and Wildlife Department last week confirmed the presence of zebra mussels in Belton Lake, nearly 200 miles south of other lakes known to contain the species. 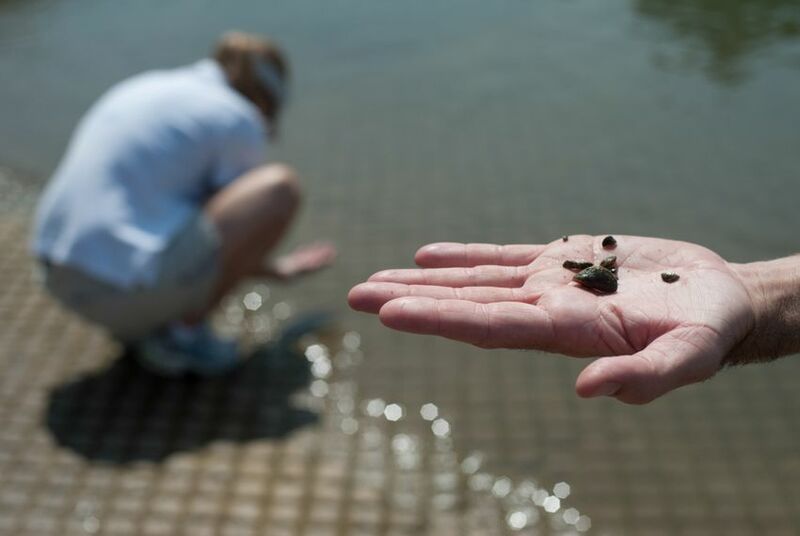 Zebra mussels were first identified in Texas in 2009, but the Belton Lake discovery marks the first confirmation of the species in the Brazos River basin. Unlike most native mussel populations, zebra mussels can attach themselves to hard surfaces, including pipes. Once they grab hold, they colonize on top of one another, bonding together so strongly within a reservoir's pipe systems that they can restrict the flow of the pumped water, said Brian Van Zee, regional director for the parks department. “Everything that’s downstream is at risk of getting contaminated as well,” Van Zee said. Although the mussels were first discovered in the lake in September, tests indicate that they may have been introduced as early as 2012. Water utilities in North Texas have struggled with zebra mussels for years. In 2009, the Lake Texoma area lost 28 percent of its water supply when local officials halted pumping for fear of spreading the mussels further. Suppliers in Central Texas could soon face similar challenges. Brad Brunett of the Brazos River Authority said Belton Lake primarily supplies water to nearby cities, including Temple, Killeen and Gatesville. “There is long-term potential, depending on how well the zebra mussels do in Lake Belton, for water suppliers to experience some maintenance issues,” he said. But he added that suppliers have time to plan. “It’s not a permanent, end of the world, your pipeline’s going to go away scenario,” he said. Bell County Water Control and Improvement District No. 1, the BRA’s largest customer, has a water intake structure at Belton Lake. General Manager Jerry Atkinson said the zebra mussels were a surprise. He is still evaluating the severity of the infestation, but he said he has a response plan in place. “My guess is that they’re not too terribly bad right now,” he said. It’s too early to tell what maintenance measures will be necessary to combat them, but “it will not be expensive until you start having to retrofit or use chemicals,” he said. Tiffany Morgan, an environmental planner with the Brazos River Authority, said there is still a lot to learn about how the zebra mussels will react in Belton Lake and in the river basin. “The good news is there is not a reservoir downstream to be releasing to,” she said. Environmental experts are concerned about the mussels’ long-term consequences as population and water demand in Central Texas continue to grow. Zebra mussels are highly effective filter feeders that compete with native species and remove phytoplankton, a fundamental component of the freshwater food chain. Van Zee said the mussels cause an ecosystem imbalance that may affect water quality over time. Some research, he said, indicates that zebra mussels may lead to an increase in blue-green algal blooms, which can be toxic to humans. The Texas Parks and Wildlife Department has issued a temporary emergency order requiring boaters at Lake Belton to drain their vehicles and equipment of water before leaving the lake. It's a practice the department has called crucial to stopping the mussels from spreading, because contaminated boats are often responsible for transporting the invasive species, a violation of state law. Van Zee said the department is working to make the boat-draining rule permanent.